What is the Munro Beattie Lecture? 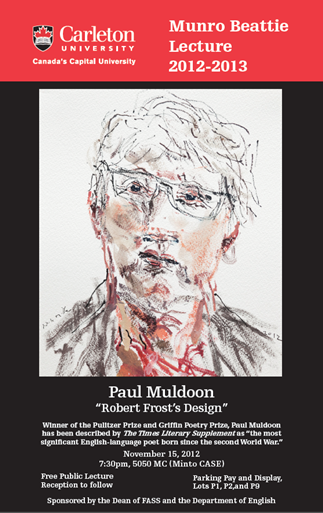 This annual distinguished lecture was launched in 1985 to honour the department’s founding chair and his contributions to literary studies in Canada. An important principle of the lecture series has been to invite writers and critics who can speak on issues of importance to the general public, as well as the academic world. The first lecture was given by Munro’s friend and colleague, Eli Mandel, and the second by Northrop Frye. Since then the series has been an important annual event at Carleton, sponsoring a challenging group of literary critics and creative writers, including Linda Hutcheon, Robert Kroetsch, Jeanette Armstrong, Roy Miki, Carol Sheilds, George Elliott Clarke, Mark Kingwell, Eleanor Wachtel and Alistair MacLoed. A classmate and friend of Northrop Frye at Victoria College, University of Toronto, Munro Beattie was a founding member of Carleton’s English Department and its chair for over twenty years (1953-1969). He built a department known for its collegiality, commitment to teaching and public service. A Henry James scholar and admired teacher, Professor Beattie was known in the University for his wit, civility, and humanity, and as an engaging conversationalist. His broad understanding of all the arts, including theatre, music, and the cinema, animated his teaching, his scholarship, and his many friendships. 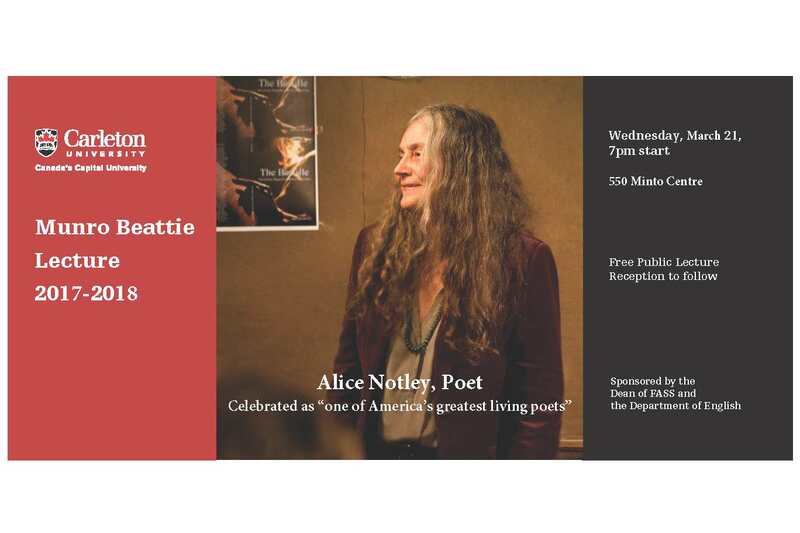 Celebrated as “one of America’s greatest living poets,” Notley is the author of over forty books of poetry and critical prose.She is the recipient of numerous prestigious literary awards, including the Griffin International Poetry Prize for her book Disobedience in 2002. The Mysteries of Small Houses was nominated for the Pulitzer Prize for poetry in 1999. Alexis was awarded the 2015 Scotiabank Giller Prize for his novel Fifteen Dogs, part of a projected five-part series of novels, each one involving the conventions of a different genre. His most recent novel, The Hidden Keys, was published September 2016. After shooting to literary fame with his first novel, Three Day Road, Boyden won the Scotiabank Giller Prize for his second, Through Black Spruce. His most recent novel, The Orenda, was nominated for both the Giller Prize and the Governor General’s Award, and was the winning title on CBC Radio’s Canada Reads competition in 2014. Carleton alumna and winner of the 2013 Scotiabank Giller Prize for her short story collection Hellgoing. Drawing upon examples from her work and experiences with readers, Coady’s talk, entitled “On Storytelling and Discomfort,” addressed the question of how the best, or at least the most honest, storytelling is that which makes the teller and the listener uncomfortable to varying degrees. Eden Robinson’s first book, Traplines, a collection of short stories, won the Winifred Holtby Memorial Prize and was a New York Times Notable Book of the Year in 1998. Monkey Beach, her first novel, was shortlisted for both The Giller Prize and the Governor General’s Literary Award for fiction in 2000 and won the BC Book Prize’s Ethel Wilson Fiction Prize. Her most recent novel is Blood Sports. Adam Gopnik, a writer for The New Yorker magazine, is one of the most prominent writer-commentators in North America, and one of the most gifted essayists writing in English. He has won the National Magazine Award for Essays and for Criticism three times, and also the George Polk Award for Magazine Reporting. Winner of the Governor General’s Literary Award for poetry for Night Field (1991) and Another Gravity (2000). McKay was also the Canadian winner of the Griffin Poetry Prize for Strike/Slip (2006). 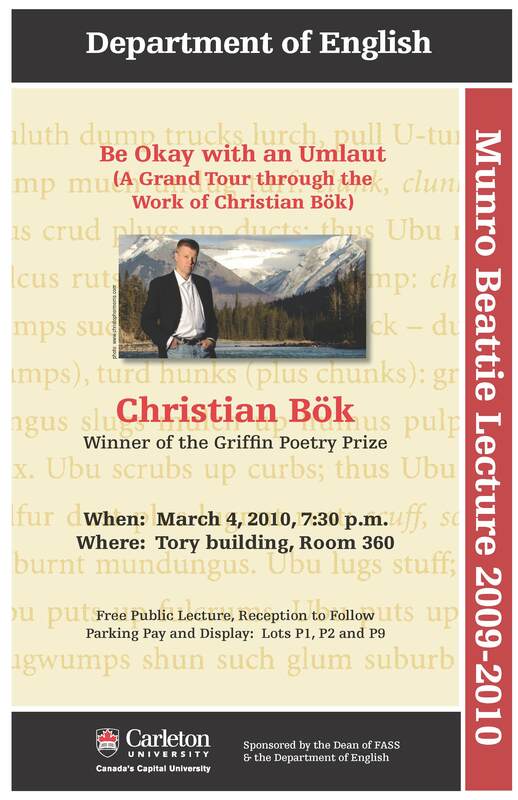 Prominent Canadian figure in the international scene of avant-garde writing, Christian Bök, presented his lecture, “Be Okay with an Umlaut (A Grand Tour through the work of Christian Bök)” on March 4, 2010. 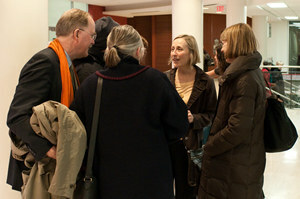 Ottawa novelist Elizabeth Hay presented her lecture, entitled “The Writer as Returned Traveler” on March 11, 2009.